Charles Makley, aka: Charles McGray and Fat Charles (1889-1934) – A bank robber and associate of John Dillinger. He was captured in Tucson, Arizona, extradited to Ohio and Makley was sentenced to die in the electric chair. He was transferred to the Ohio State Prison at Columbus and was killed during an escape attempt on September 22, 1934. William “Ty” Martin – An African-American bank robber, he, Arthur Barker, Rufus McDain, Dale Stamphill, and Henri Young attempted to escape from Alcatraz in January 1939. Barker was killed, Stamphill wounded, and the others recaptured and sent to solitary confinement. Rufus McCain (? ?-1940) – Sentenced to Alcatraz, McCain attempted to escape with Henri Young and Arthur Barker in January 1939. He was recaptured only to be killed by Henri Young on December 3, 1940. Ben Golden McCollum (1909-1963) – Nicknamed the “Sheik of Boynton,” McCollum was an outlaw in Oklahoma during the 1920s. Henry Methvin (1912-1948) – A Barrow Gang member, robber and murderer, Methvin caught a break when his father helped to set up Clyde Barrow and Bonnie Parker. He served ten years in an Oklahoma prison before being released. He was killed by a train in 1948. Vernon C. Miller (1896-1933) – Involved in the Kansas City Massacre, an attempt to free outlaw Frank “Jelly” Nash from authorities, Miller was a known freelance Prohibition gunman, bootlegger, bank robber, and former South Dakota sheriff. Shortly after the massacre, he was found dead in a ditch on the outskirts of Detroit, Michigan. Irving Milberg – A member of the Purple Gang, Millberg was sentenced to life in prison in 1931 for murder. Harry Millman – A member of the Purple Gang, Millman was assassinated in November 1937. George Clarence “Bugs” Moran (1893-1957) – A Chicago Prohibition-era gangster, he was affiliated with several gangs early on and was incarcerated three times before he was 21 years old. He was the target in the St. Valentine’s Day Massacre but was not yet there when the killings occurred. 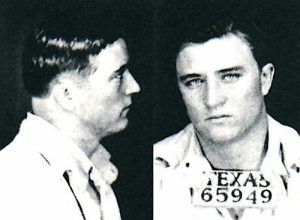 He was later captured and died on February 25, 1957, in Leavenworth Prison of lung cancer. Joseph P. Moran (1905-1934) – A physician known for treating Depression-era gangsters and a peripheral member of the Barker-Karpis Gang. He was most likely the last doctor to see or treat the mortally wounded John Dillinger. He was thought to have been murdered by Alvis Karpis and Fred Barker. Giuseppe “The Clutch Hand” Morello (1867-1930) – Also known as Joe and as “The Old Fox”, he was the first boss of the Morello crime family and later top adviser to Giuseppe “Joe the Boss” Masseria. Frank Lee Morris (1926-??) – Born in Washington, D.C. on September 1, 1926, Frank was orphaned at age 11 and spent most of his formative years in foster homes. He was convicted of his first crime at the age of 13, and by his late teens had been arrested for crimes ranging from narcotics possession to armed robbery. Morris was exceptionally intelligent, ranking in the top 2% of the general population as measured by IQ testing. He served time in Florida and Georgia, then escaped from the Louisiana State Penitentiary while serving 10 years for bank robbery. He was recaptured a year later while committing a burglary, and sent to Alcatraz in 1960. He, along with John and Clarence Anglin, escaped in June, 1962 and were never seen again. Frank Mulloy – Part of the Kansas City Massacre Conspiracy, Mulloy spent time in Alcatraz. Murder, Inc. – Or, Murder Incorporated was the name the press gave to organized crime groups in the 1930s to the 1940s that acted as the “enforcement arm” of the Italian-American Mafia, Jewish mob and connected organized crime groups in New York and elsewhere. Edna “Rabbits” Murray (? ?-1966) – Depression-era outlaw and partner of Volney Davis during the early 1930s. Frank “Jelly” Nash, aka: Charles B. Edgar, Doc Williams (1887-1933) – Sentenced to life in prison for an Oklahoma murder, he was later pardoned. In 1920 he was sent back to prison for robbery but was again pardoned. In 1924, he was back in prison at Leavenworth, Kansas for assault, but escaped in 1930. He was killed in the Kansas City Massacre, a shootout at the Union Station railroad depot on June 17, 1933. George “Baby Face” Nelson, aka: Lester Joseph Gillis (1908-1934) – Though his name was actually Lester Gillis, he was better known by “Baby Face” Nelson during his criminal days. A major bank robber in the 1930s and partner of John Dillinger and Homer Van Meter, The FBI caught up with him in November 1934. In the gun battle that ensued, he was shot and killed. The North Side Gang – Also known as the North Side Mob, this Chicago based criminal organization was primarily made up of Irish-Americans during the Prohibition era. They were the principal rival of the Al Capone’s gang, the Chicago Outfit. Harry “Pete” Pierpont (1902-1934) – A Prohibition-era gangster, he was a good friend of John Dillinger. He was captured in Tucson, Arizona, extradited to Ohio and sentenced to die in the electric chair. He was transferred to the Ohio State Prison at Columbus and was killed during an escape attempt on September 22, 1934. Adam “Eddie” Richetti (1909-1938) – Involved with Vernon Miller and Charles Arthur “Pretty Boy Floyd,” Richetti was involved in the Kansas City massacre. He was later arrested and executed in the gas chamber of the Missouri State Penitentiary on October 7, 1938. Mary O’Dare – The girlfriend of Barrow Gang member Raymond Hamilton, the 19-year-old girl was not liked by most of the members of the gang. After a dispute with Clyde Barrow, she and Hamilton left the gang. 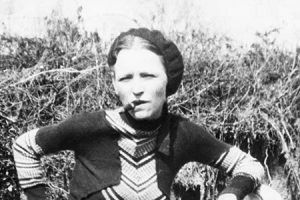 Bonnie Parker (1910-1934) – Half of the Bonnie and Clyde pair, these two were criminals who, with their gang, traveled and robbed numerous locations in the central United States during the Great Depression. 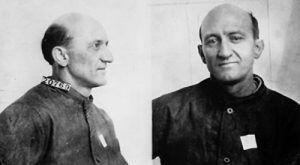 Rufe Persful – A gangster and bank robber, Persful was a trusty at Tucker State Prison Farm in Arkansas when he chopped off two fingers of his hand to gain a transfer to Springfield, Missouri. He was later sent to Alcatraz. Donald Phoenix – A Barker-Karpis Gang member, Phoenix spent time in Alcatraz. 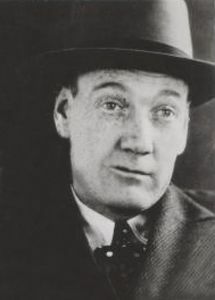 Harry Pierpont (1902-1934) – Prohibition gangster and friend and mentor of John Dillinger. He was executed in the electric chair on October 17, 1934. 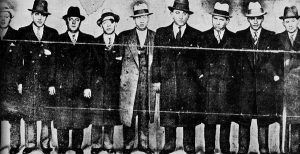 Purple Gang – A mob of bootleggers and hijackers in the 1920s in Detroit, Michigan run by Abe Bernstein. The gang ran alcohol products from the Detroit port from Canada. Some of the most ruthless bootleggers of their time, they are estimated to have killed more than 500 rival gang members during Detroit’s bootleg wars.